ECOBAC friends, another year full of successes and achievements, and we are glad to know that you are part of it. We are excited since this next December 8th begins the official whale watching season; as a matter of fact, the first reports of whales have already been registered. We know that Banderas Bay is one of the favorite places for the humpbacks, where they spend the winter, mate, have their calves, enjoy the warm waters and enchant us with their presence and songs. This makes us very happy, however, the season has not yet officially begun, and we have had already two cases of entangled whales, which have been attended by RABEN promptly. 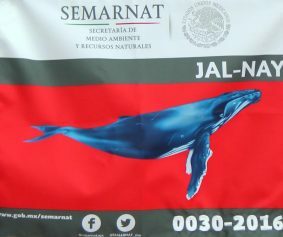 If you would like to know more about what “Red de Asistencia a Ballenas Enmalladas” (RABEN- Mexico Whale Disentanglement Network) does in Mexico, we encourage you to watch the following video: https://youtu.be/ifwJ4URDvZ4. 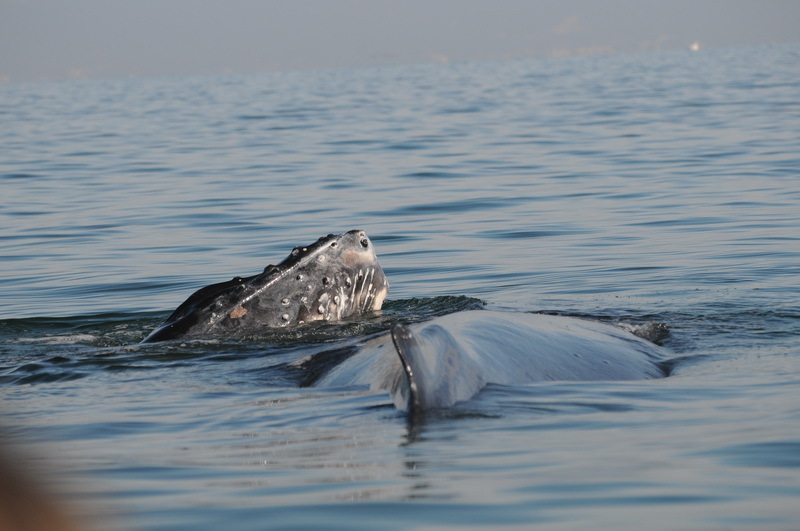 – Thanks to “Fundación Punta de Mita” and Opequimar, this season will continue with the Prevention, Information, Surveillance and Monitoring Program of Humpback whale in Banderas Bay, where along with ECOBAC volunteers, and in collaboration with staff from PROFEPA and SEMAR, weekly trips are to be done in the bay, providing information, and monitoring that both tourism and private vessels are following the whale watching guidelines set forth on the NOM-131-SEMARNAT-2010. – Reach a greater number of people informed about correct whale watching procedures, so whales can enjoy a pleasant stay in their breeding grounds.What have we been doing? Conservation of marine mammals in the world: 4th. 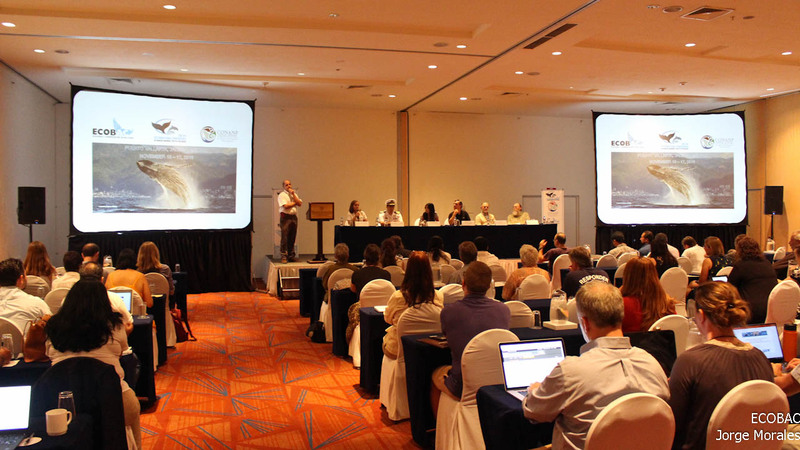 CONGRESS ICMMPAscientists and educators in which they could discuss and share common challenges, as well as provide with solutions for the protection and conservation of marine mammals in the world. 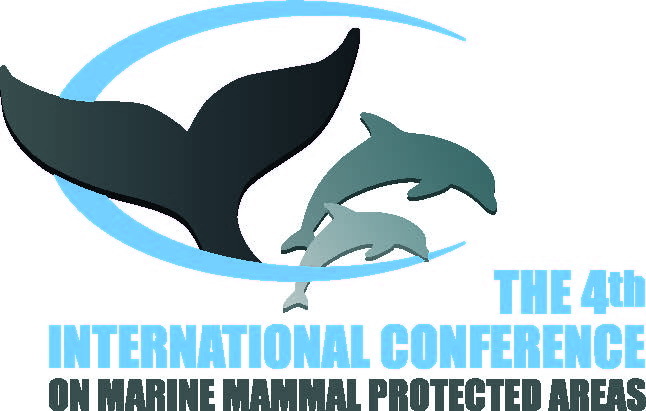 The Congress had the presence of representatives of 14 countries from all continents, all focused on creating partnerships among the different nations which would help to guarantee the protection of marine mammals no only in protected areas but also in the high seas. 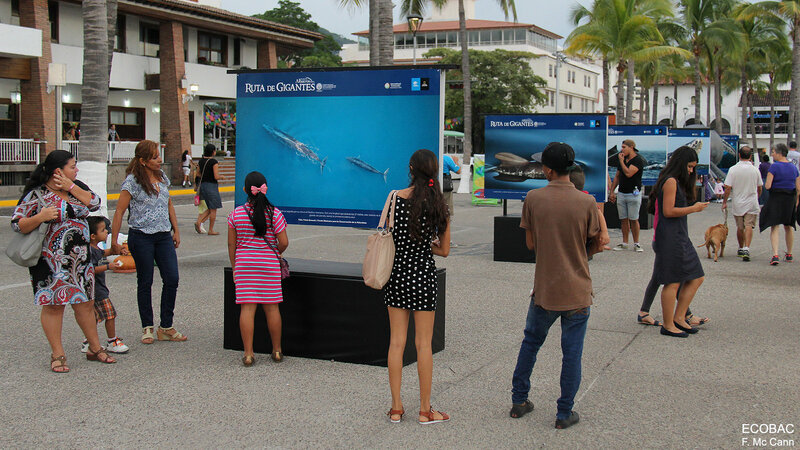 On the 16th of November, the event “A night with giants” screened through video, three cases of success in the field of conservation of whales in Mexico, such as Gray whale, Blue whale and RABEN. Then on the 17th of November, the documentary “Sonic Sea” made its premiere in Mexico. This documentary deals with the issue of noise pollution and the negative effects on marine mammals, mainly whales. Both events had very good audience; those present did not lose the opportunity to ask the experts what they always wanted to know. Last but not least, we encourage you to learn more about this documentary, and invite you to click on the following link http://sonicsea.org/, or if you would like to see a trailer, just following this link https://youtu.be/T-jabL64UZE. Please stay tuned since the documentary will be soon screened in the city, it is a documentary that should not be missed, without any doubt it will make an imprint on you. Thanks to the program PROCER from the “Comisión Nacional de Areas Naturales Protegidas” (CONANP), the first RABEN national meeting was held and had the presence of members of the Global Untangling Network from United States of America and Canada. 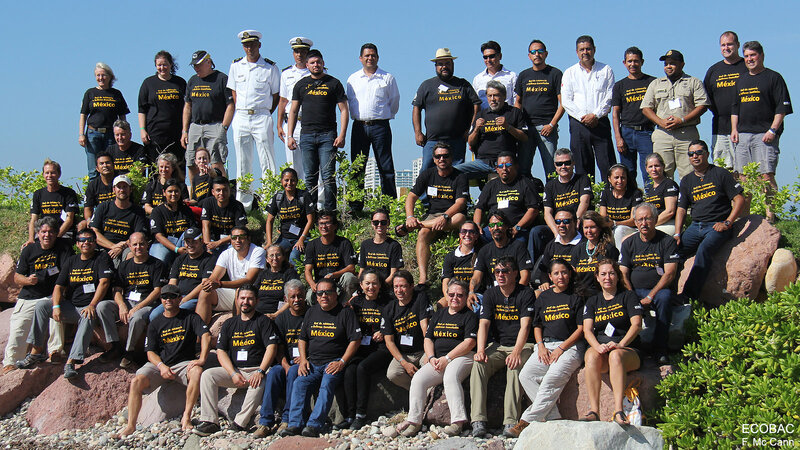 Their presence helped to enhance the creation of strategies to operate when it comes to addressing cases of entangled whales that migrate towards and from Mexico For the first time, where gathered representatives of the 15 RABEN teams of Mexico, many experiences were shared, and there was a thorough review of the protocol to be follow on any given great whale entanglement situation. This made clear that these guidelines are those that allowed having a positive outcome on more than 70 reports without any incident. 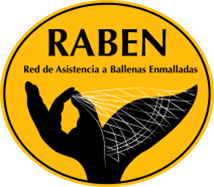 In addition to this, another objective of the meeting was to share strategies and suggest ideas to improve the efficiency, and have a more effective communication among RABEN groups when a report surges. At the end of this meeting, a yearly meeting proposal was launched. Ready to greet the whales! At ECOBAC we are getting ready to receive the whales and continue contributing so that at their arrival to the bay they are not harassed, and their reproductive and breeding activities are not interfered with. This is why this year, thanks to the support of Opequimar and the “Fundación Punta de Mita” (with funds from the sale of Viva Natura books), we will continue with the program of prevention, information, monitoring and surveillance of whales in Banderas Bay, which has already been operating for 5 years while informing and raising awareness among the tour operators or captains of the boats on the right way to do the activity of whale watching. This program is done in collaboration with 8th Zona Naval and PROFEPA Jalisco and Nayarit. We will continue with the campaign “I care for the whales” to inform locals and tourists in the marinas of the Bay on the positive activities during their holidays that would not affect the whales, but still allow them to enjoy and see these majestic animals. It is important to give continuity to this program, as these 5 years have shown positive results, but more is still needed. Part of the commitments of the whale watching tour operators is to assist to a yearly course by SEMARNAT, by the end of this each shall receive a permit and flag that would identify them as properly trained tour operators, and guarantee the safety of both tourist and whales. 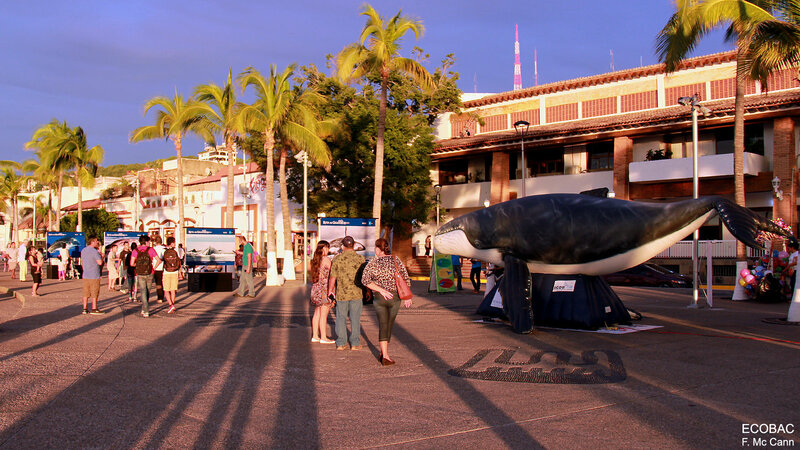 The event was held in Nuevo Vallarta Nayarit, and was attended by approximately 250 people, including vessel owners and their crew. 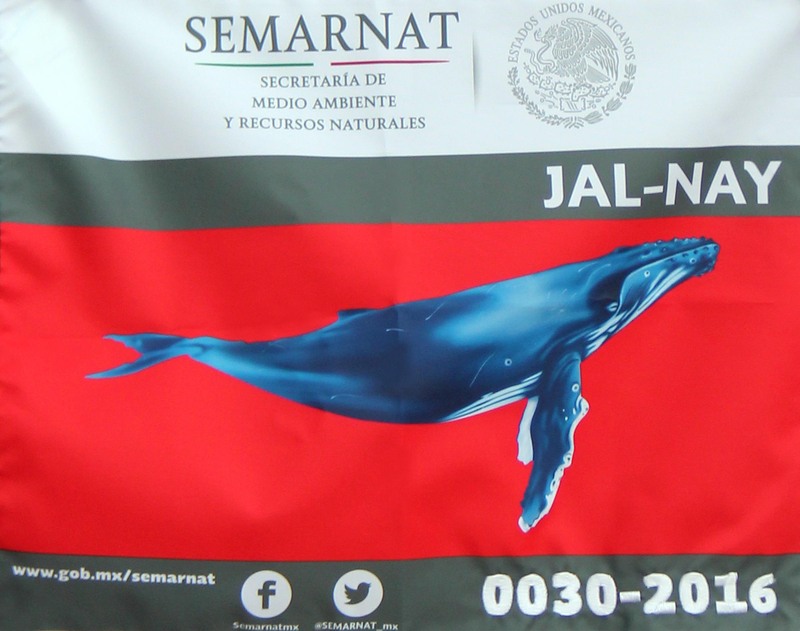 During the course, topics included the Mexican standard for the observation of whales, the causes that may lead to incurring a violation and general biology of whales, etc. Within this training, ECOBAC shared and celebrated 20 years of the FIBB catalog, as well as some videos on about blue whale watching in Loreto and the RABEN meeting. We hope you are as excited as we are by the whale season. We thank you kindly for staying alert and following us, as well as being part of ECOBAC. On behalf of the entire team, we wish you a Merry Christmas and a Happy New Year .